Lightens and restores color to all greyed weathered marine wood without bleaching. Fast acting, restores within 20 minutes. Excellent degreaser for tropical hardwoods prior to applying DEKS OLJE D.1 saturator. Neutralises the action of MARINE STRIP. Safe to use – harmless to plants and shrubs. 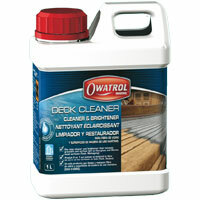 Apply DECK CLEANER with a soft brush (do not use a wire brush). Do not allow Deck Cleaner to dry on Surface. If drying occurs dampen with mist application of water. Allow solution to stand for 10-20 minutes. Scrub surface while rinsing with water or use a pressure washer (max. 60bar/870psi). Allow surface to dry before applying a finish.